Places to visit in Bhopal, India - including day trips! When it comes to India, there are lots of famous highlights that tourists flock to visit. But Bhopal is rarely on the radar. The capital city of Madhya Pradesh often isn’t on the itinerary for foreigners visiting India. Unfortunately, they are missing out. Bhopal is interesting enough as a city itself and there are quite a few place to visit in Bhopal. Historic neighbourhoods, charming lakes, and world-class museums are just some of the things to see in Bhopal. But it’s really what you can access from here that makes it such a great place for tourists. With just a short drive, there are places to visit near Bhopal ranging from the historical, to the religious, to the natural. There are even two World Heritage Sites near Bhopal. I’m not sure why more people don’t come here. Perhaps they don’t know what there is to visit in Bhopal and the area around the city. Or perhaps they don’t even realise Bhopal exists? Or maybe the problem is that people do know Bhopal exists – and they still associate it solely with the Bhopal disaster. The accident at the Union Carbide plant in Bhopal on 2 December 1984 released at least 30 tons of toxic gas into the atmosphere. There was never an official death toll but the government now estimates about 15,000 people died as a direct result. 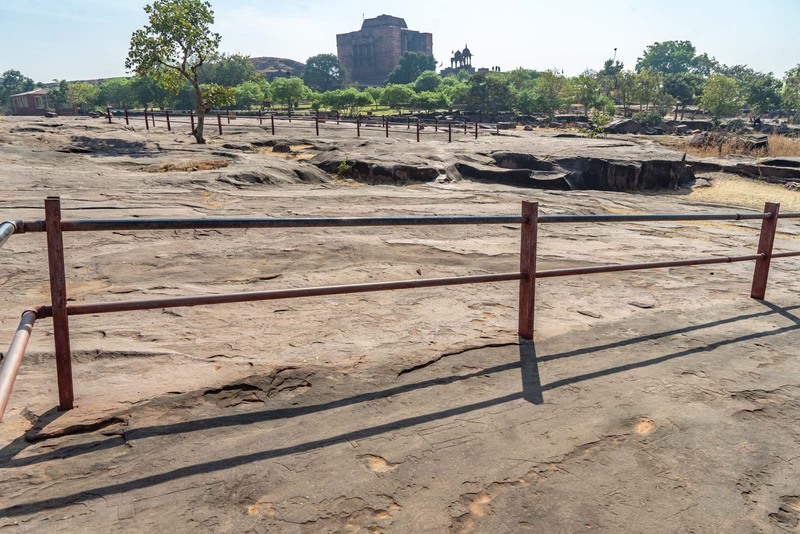 It was the world’s worst industrial accident and the Union Carbide site still sits in Bhopal, an abandoned factory with a small memorial outside. I understand why it may be hard to forget – and, in honour of the victims, perhaps we never should. But we should also be able to look beyond something that happened more than 30 years ago and appreciate a city for what it offers today. And so that’s why I want to put together a bit of a list of the best places to visit in Bhopal and also take a look a bit further afield at the best places to visit near Bhopal. 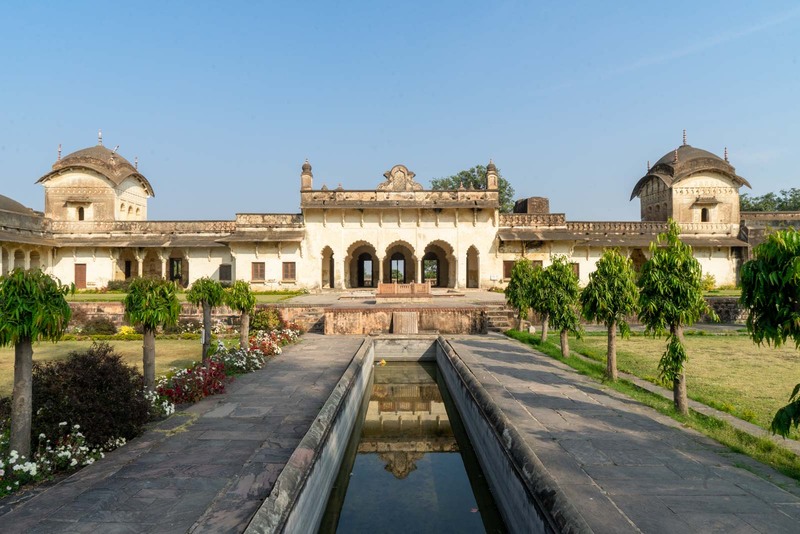 As I hope you’ll realise, there is easily enough to spend about 3 days in Bhopal and surrounds, particularly to visit some of the most important historical sites in India. Bhopal is a big city although, by Indian standards, it is relatively calm. Traffic is normally quite good, the crowds and the poverty is not particularly confronting, and it’s not too hard to explore as a visitor. There are some very interesting tourist places in Bhopal and there are some more local parts of the city that are fun for visitors to explore. Here are a few of my top tips for the best places to visit in Bhopal. 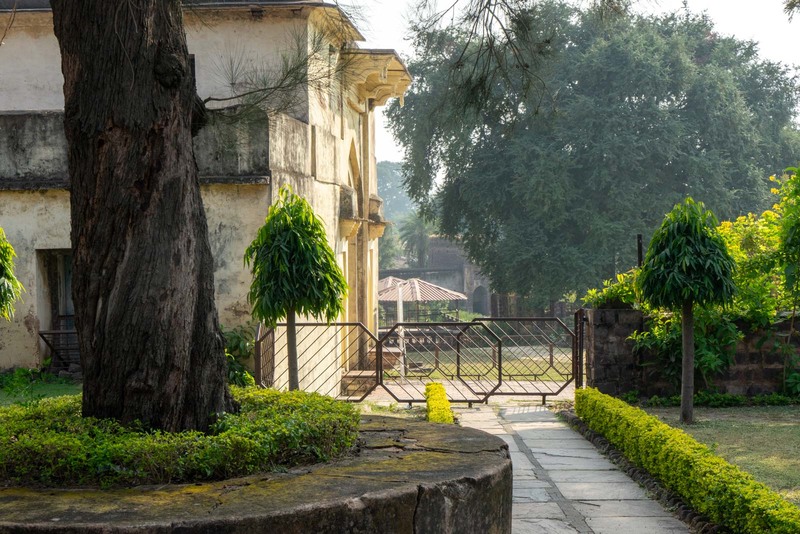 To understand the history of Bhopal, I would suggest spending some time exploring Old Bhopal. 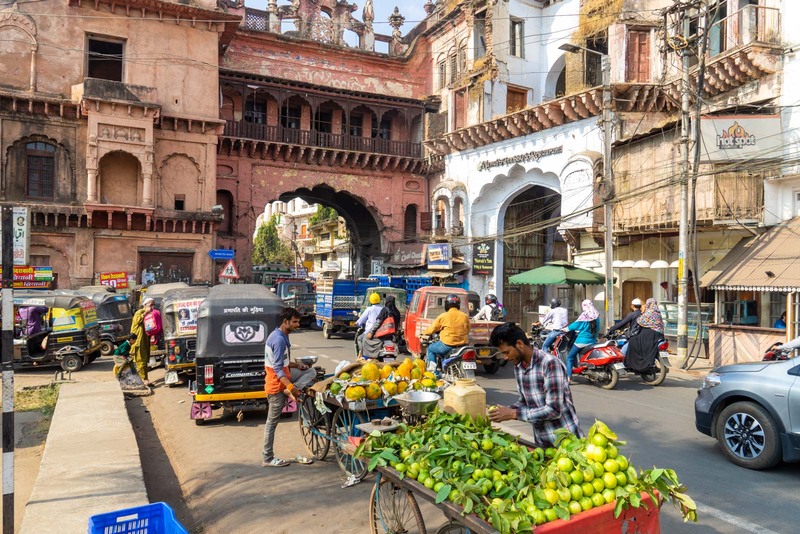 This central neighbourhood is a fascinating blend of Islamic heritage with modern Indian life. 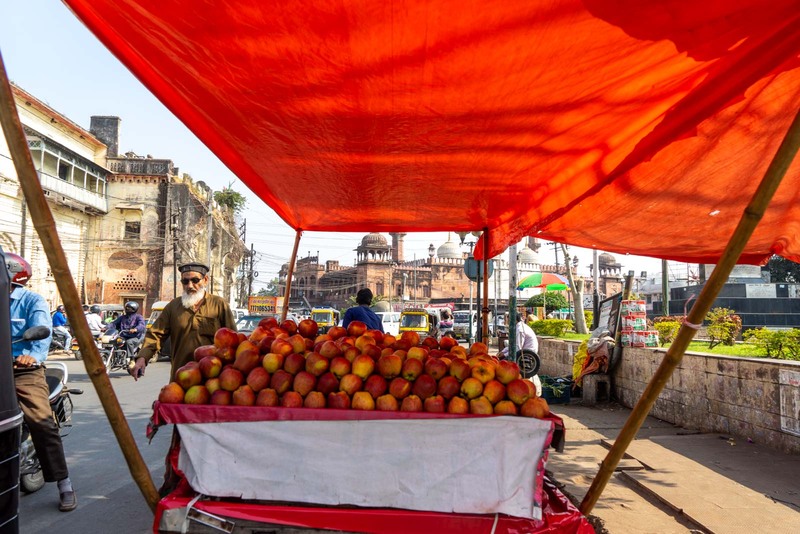 The heart of the Old City of Bhopal is the Chowek, where you’ll find grand palatial buildings and lanes full of shops and cafes. In the centre of the old city is the Jama Masjid mosque, built between 1832 and 1857 by the first female ruler of Bhopal, Qudsia Begum. Although it was her granddaughter Shah Jahan Begum, the third female ruler of Bhopal, who created the magnificent Taj-ul-Masajid mosque that has become one of the city’s most impressive landmarks. I think the most photogenic part of Old Bhopal is around Iqbal Maidan garden, where you’ll find restored palaces, market stalls, and views through the old city gates down to the lake. You’ll get a lot more out of seeing the district with a local. Luckily, there are some excellent tours. I would recommend either this option or this one. There’s a reason that Bhopal is also known as the ‘City of Lakes’. It has more than a dozen lakes through its urban area, some natural and some created by dams centuries ago. The locals love to make the most of the water and I think one of the best places to join them is at the Upper Lake, the main lake that you’ll see next to Old Bhopal. Here, you can head to the Boat Club where there are a few different options to head out on the water. You can hire a paddle boat for 100 rupees (about US$1.50) or a motor boat for 300 rupees (about US$4.50). If you would prefer just to see the lake without too much effort, you can go onboard the cruise boat for just 130 rupees (US$1.80). You can also just walk around some of the lake and enjoy the wonderful views. It’s a very peaceful part of the city and not the kind of thing you expect to find in an Indian city. This incredible museum is world class and, when you visit, you’ll be surprised that you’ve never heard of it before. 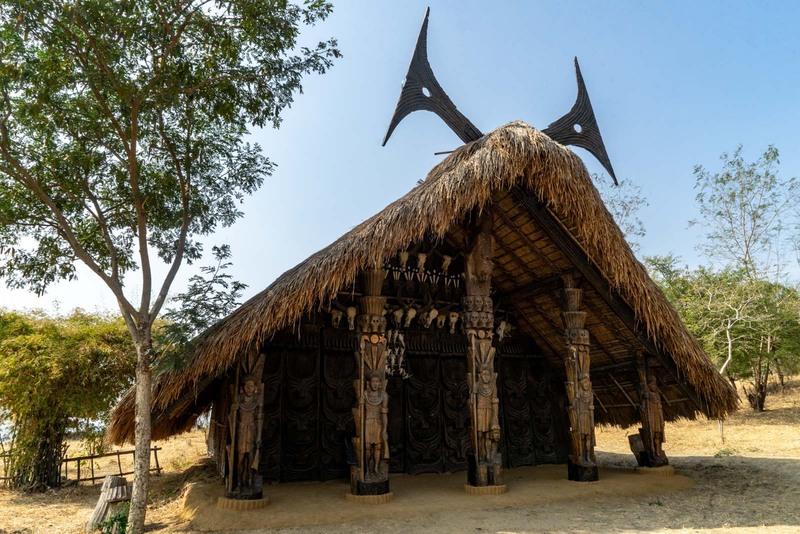 Madhya Pradesh Tribal Museum was opened in 2013 and has six colourful galleries that tell the stories of the local tribal heritage. With immersive displays, it takes you on a journey through the art, traditions, daily life, and accommodation of a number of indigenous groups. 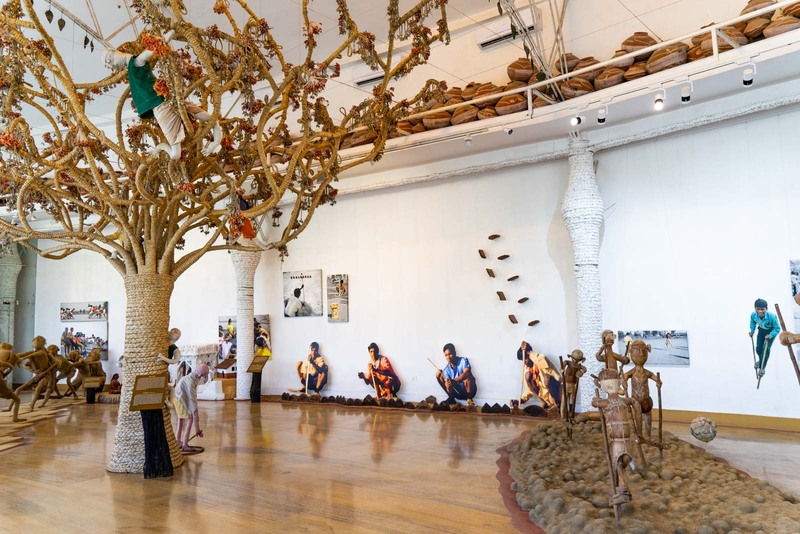 In the Tribal Life Gallery, you’ll find fill-sized models of the tribes’ houses; in another gallery stories of worship are portrayed through impressive art installations; and there are some really interesting ways of showing the connection between spirituality and everyday objects. Right next door to the Madhya Pradesh Tribal Museum is the State Museum. This more traditional gallery has a good collection of artefacts from archaeological sites and other important displays of the history of the region. Another incredible museum in Bhopal is the Museum of Man, that shows the story of human development in this part of the world. The museum is presented in two parts. The first is an indoor museum that has dozens of galleries spread out over three levels. It’s very good – but I think the more interesting part is outside. This is where a 40-hectare area is used to display houses and other important buildings from different tribal communities across India. Some of the dwellings were transported from their original locations, while others were built here but with materials from the community. You can go into a lot of these houses and get a sense of what it might be like to live there. There are desert homes, a Himalayan village, and coastal abodes. As I said earlier, it’s not just inside the city limits that you’ll find good tourists places in Bhopal. In fact, I think some of the highlights of your time here will be in the area around. Here are my tips on the best places to visit near Bhopal. 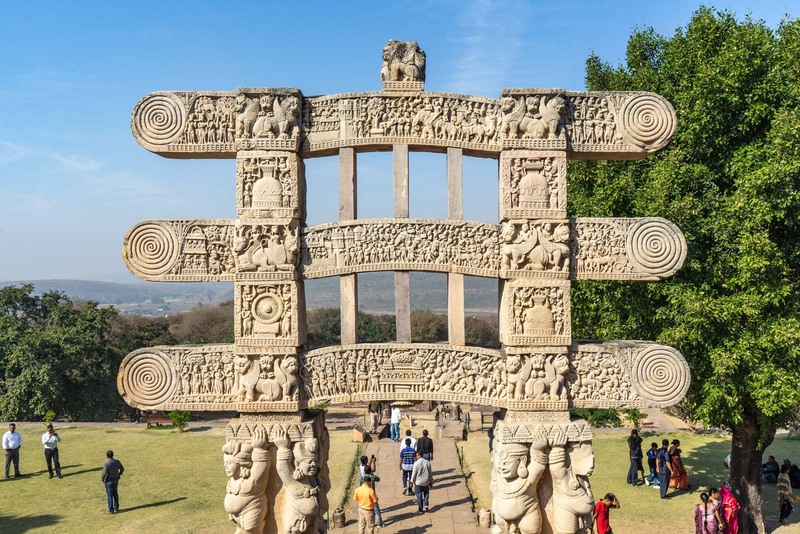 Probably the most important place near Bhopal is Sanchi, where you’ll find one of the most significant Buddhist sites in the World. The Great Stupa at Sanchi was built in the 3rd century BC by the famous Indian Emperor Ashoka, who is credited with turning Buddhism into a mainstream religion by adopting it himself and then spreading it across India. 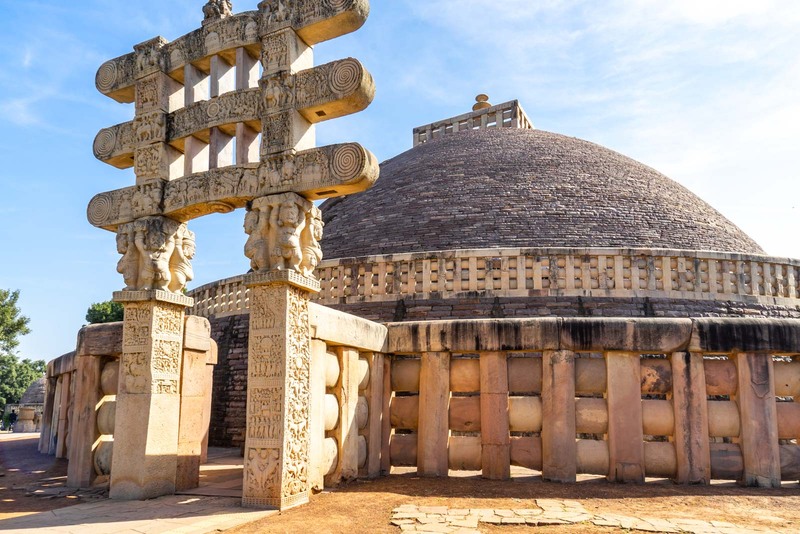 The Great Stupa at Sanchi is an incredible construction that is particularly famous for the carved artworks on the four stone gateways around the Stupa. In them, you can find scenes from the life of Buddha and other important events. 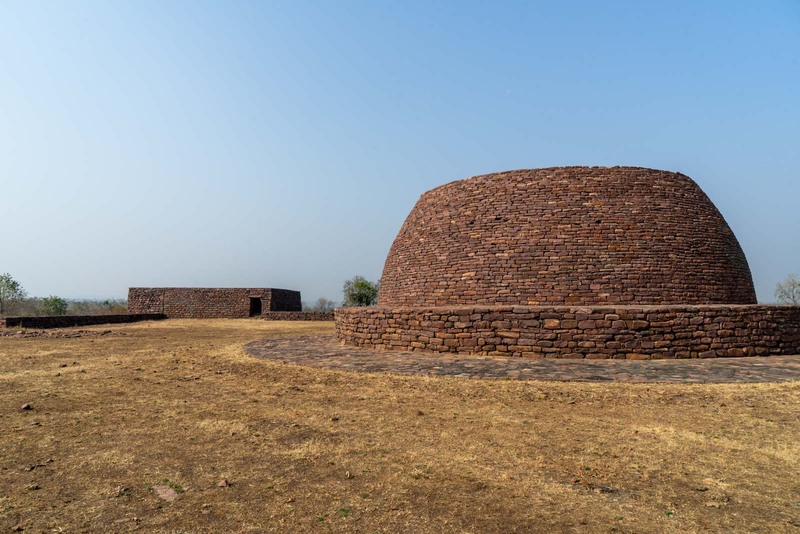 There are a lot of other small stupas and remains of temples and monasteries at the site because Sanchi became an important Buddhist cultural centre more than 1000 years. It has been designated as a World Heritage Site. There’s also a good archaeological museum on the site that has on display some of the most significant artefacts found on the site. If you would like a private tour to take you out the Sanchi, you could try this option or this option. Check the prices for the number of people in your group because it will get much cheaper per person the more you have with you. With Sanchi as such an important Buddhist centre, it’s perhaps no surprise that small settlements sprang up in the region. Each of these other Buddhist communities had their own centres of worship but were close enough to Sanchi that they could visit. There are four of these old Buddhist settlements that you can still visit today – Satdhara, Sonari, Andher, and Murelkhurd. The largest of the communities is at Satdhara. 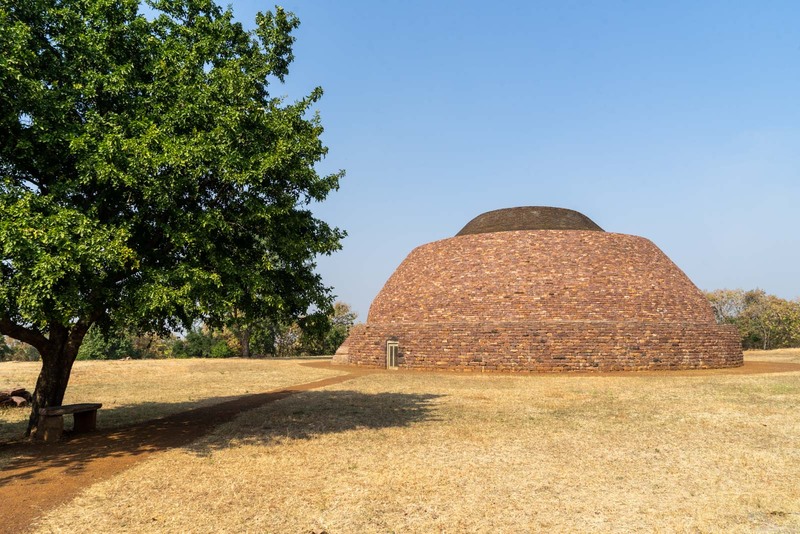 The main stupa here was built during Emperor Ashoka’s lifetime and many of the others are from as early as the 2nd century BC. Sonari is also an impressive site, where the largest stupa is about 15 metre in diameter. You can walk along its elevated walkway to get a sense of the size. The other two also have interesting things to see, such as the carved railing around a stupa at Andher – but neither is quite as impressive as the first two. 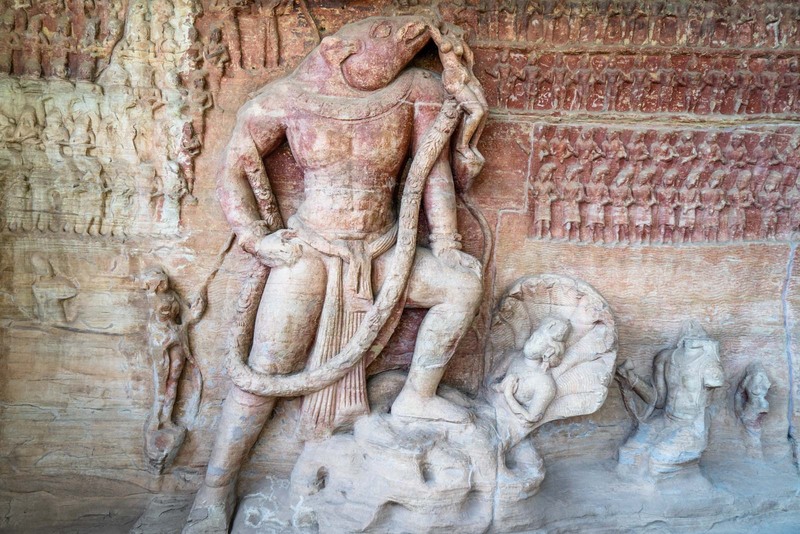 Not too far from Sanchi are the Udaigiri Caves and I think they are definitely worth visiting once you’ve made the drive out here. 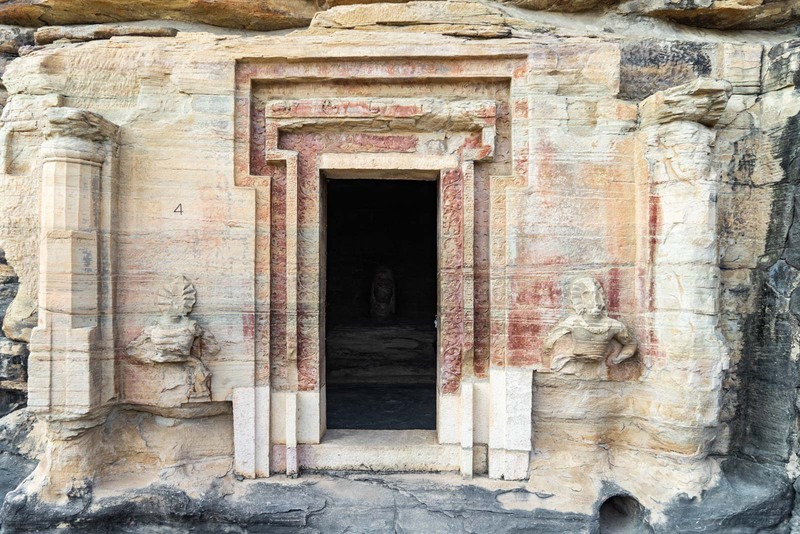 The Udaigiri Caves are manmade and were carved into the rocks around the 4th and 5th centuries AD. They also have beautifully-chiselled entrance, architraves, and pillars. There are 20 caves in total – 18 are Hindu and two are Jain. Many of them have stunning religious sculptures carved into the rock. The most impressive of them all is a sculpture of Vishnu in his incarnation as a boar raising the earth goddess Prithvi from the oceans. The enormous artwork is 14 metres wide and 7 metres high and has dozens of worshippers carved on either side. My only concern with the site is that it’s not particularly well presented. A lot of the caves are locked off with metal bar doors and you have to peer in. I understand they need to be protected but surely there is a better way. Close to the Udaigiri Caves is Udairgiri Dam, which offers a nice place to get some lunch and relax. You can go boating on the dam and enjoy the landscape here. 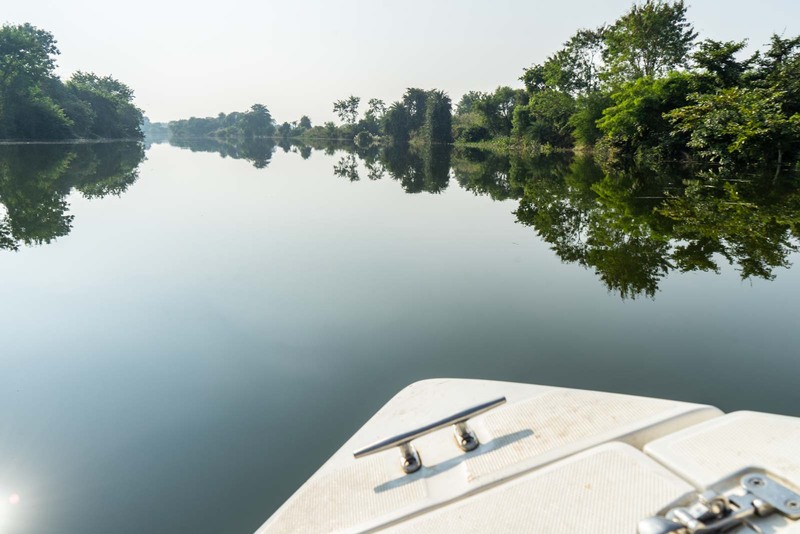 You can hire a paddleboat and go at your own pace on the water. Or, if you want a bit more adventure, you can take a rode on a speed boat that will race you along the water and jump over its own wake. Also close to Sanchi is the town of Vidisha, which is an important part of the region’s history. It’s the reason Emperor Ashoka built his famous stupa here, because the trading town had embraced Buddhism and because he was in love with a woman who lived here. These days the most important site is the Hindu temple of Bijamandal. It was built in the 11th century and would once have been enormous – what you can see today is big but was just the foundations. In the 17th century, the temple was converted into a mosque by the Mhugal Empire and you can see how the structure was adapted, with an inconsistent collection of columns. Not many people visit Bijamandal and that adds to the enjoyable experience. It’s quite a sight – and a bit of a surprise too! 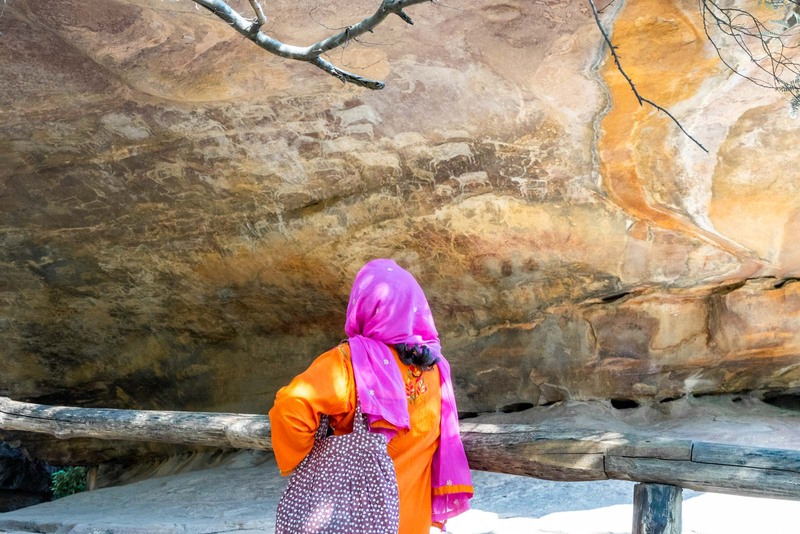 The Bhimbetka Rock Shelters is the other of the two World Heritage Sites near Bhopal. This amazing site is a must-see when you are in the region. The caves here at Bhimbetka have been used for millennia by local people to paint their stories on the rocks. There are images of animals, of battles, of agricultural techniques, and gods. The oldest of the paintings are from about 30,000 years ago and the most recent are from the Middles Ages. The reason the colours – red, white, yellow, green and black – have lasted for so long is because of the chemical reaction from the oxidation of the natural pigments. In the images, you can trace the evolution of humans in the region and get an insight into their lives. Whether it’s people riding elephants or the fashions of women, it’s a special and rare glimpse into history. 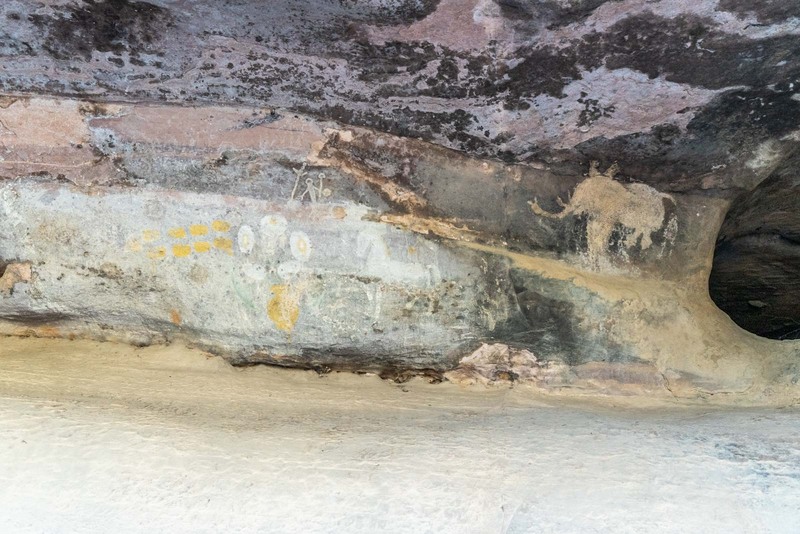 Although there are about 500 rock shelters at Bhimbetka that have cave paintings, only 15 are open to the public. Still, there is plenty to see in these open caves and you’ll get a good sense of the range and the history here. You’ll probably need to use a tour or a driver to get to Bhimbetka. I would suggest looking at this option or perhaps this option. On the way to Bhimbetka Rock Shelters, you’ll come quite close to Bhojeshwar Temple and I would recommend stopping to have a look. It’s not only the finest Hindu temple in the region, it also offers a unique insight into the construction process of the era. At the core of the temple is the abstract representation of the deity Shiva, or ‘linga’, in the temple sanctum. It’s 2.35 metres high with a circumference of nearly 6 metres. Above it is an ornately-carved ceiling with rock-carved sculptures. But make sure you also have a look at the rock surfaces on the ground near the temple. Here you’ll be able to see carvings of the architectural plans that would have been used as a reference while the temple was being built. You can also still see a ramp that large stones would have been pulled along to construct the upper levels. 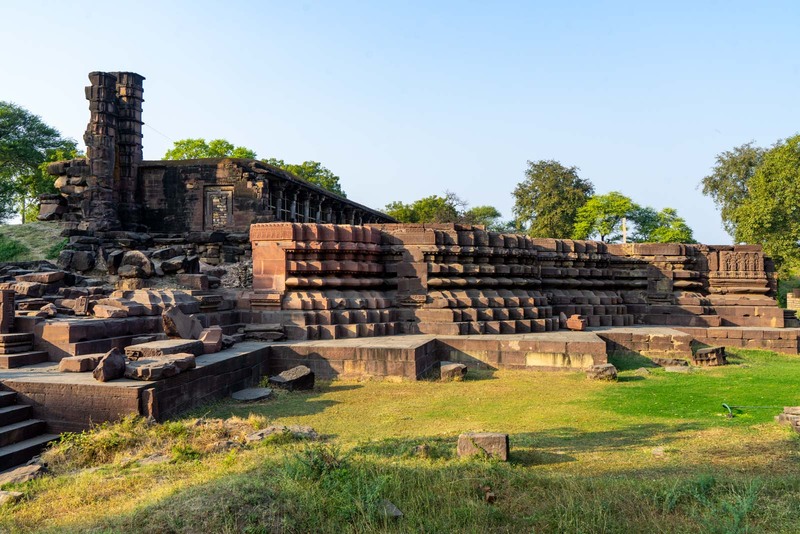 The original town of Bhojpur here at the temple was founded by the same man who founded Bhopal (Raja Bhoj). Obviously it didn’t go the same way but it’s still worth a visit. The small fortified city of Islamanagar was once the capital of Bhopal. In some ways it’s hard to imagine today because it feels like a sleepy village. Although the luxurious 18th century palaces might give it away! 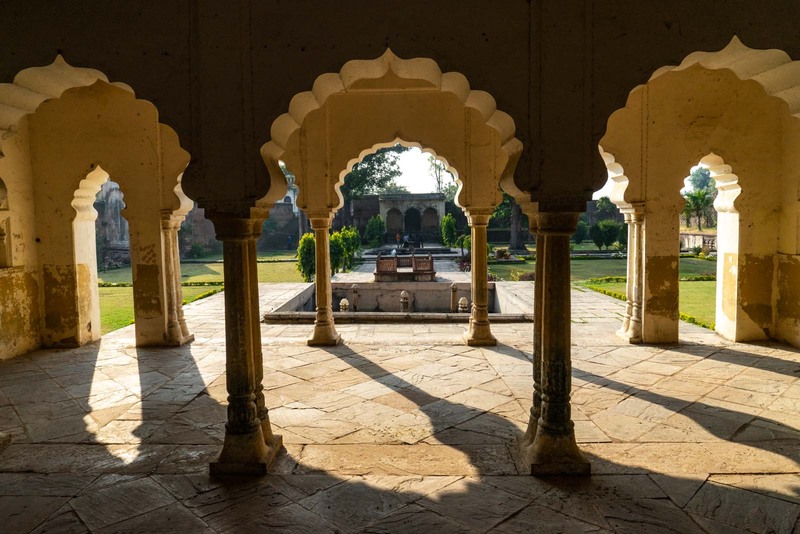 At the Rani Mahal palace, you’ll find a charming garden and a large hall with colonnades used for public meetings. There are residential rooms on the upper floors. The design of the palace shows a fusion between Mughal and Malwa styles. Outside are eight massive iron chests that were used to transport treasure. The adjacent Chaman Mahal palace is even more peaceful with a large water garden designed with a beautiful sense of symmetry. It also has a fusion of design styles, with lovely eaves drooping down from the towers. From the far end, there are nice views across the countryside. It doesn’t take too long to get from Bhopal to Islamnagar and I think it’s worth the trip so see these lovely old buildings. As you can see there are lots of places to visit in Bhopal and also lots of places to visit near Bhopal. Just because a lot of other tourists don’t visit Bhopal doesn’t mean you shouldn’t. 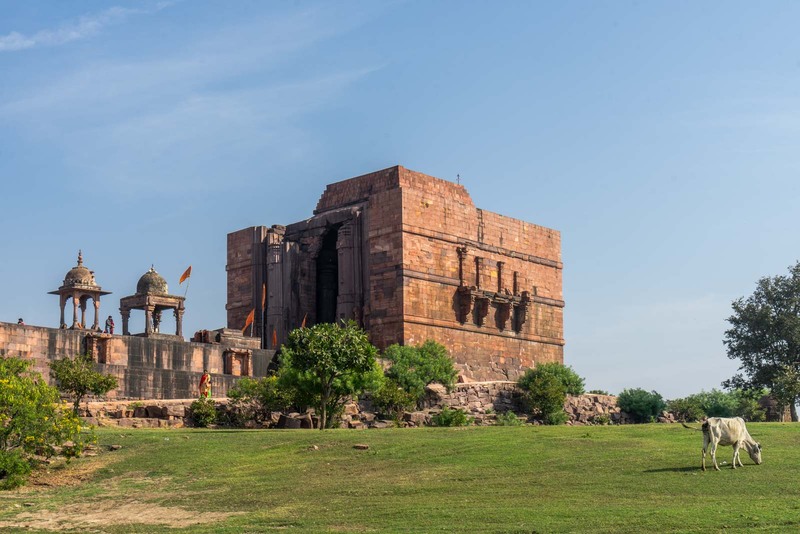 Coming here just for Sanchi and Bhimbetka is worth the trip alone – when you consider all the other things you can see, it makes it even better! Where should you stay in Bhopal? If you’re looking for a budget option, I would suggest the comfortable StayInn Hostel, which has private rooms. A good cheap option by the main lake is Lago Villa, or for something amongst the action, try FabHotel Siya Palace. If you're looking for a comfortable business-style hotel, The Courtyard by Marriott is the best in Bhopal. And I think the nicest hotel in Bhopal, which has a lovely bit of history, is the Jehan Numa Palace Hotel. I haven’t been to India and the place looks nice 🙂 It’s giving off the local vibe. Have been to India twice…but never got a chance to visit Bhopal…looking forward to it the next time.